Oh. Man. How excited have I been for this color? Well, I've only been talking about it for two months. And now it's not just in my stash, it's on my hands. Seriously, I don't even care that it's the first day of spring. It has enough bright blue and pink glitter in it to be warm weather-appropriate for me. There are a ton of reasons that I am head over heels for this color. I openly admit that I am a closeted superhero geek. I seriously came close to fainting when MAC released a Wonder Woman-themed collection because she's my favorite and can name every past, present, and, let's face it, future, member of the X-Men. I really do geek out over it. So, for me, The Black Knight is a true point of intersection for everything I love in life: nail polish, glitter, and Batman. And really, TBK does do its namesake justice. There is the very dark and dreary side of both Batman and Gotham, but equally glamorous side of upper-class Gotham and Bruce Wayne. Plus, the glitter in it reminds me of some of the Caped Crusader's more colorful foes like Joker, Harley Quinn, The Penguin, and Poison Ivy. I swear. My inner geek is dying right now. Overall, I can't recommend this polish enough. 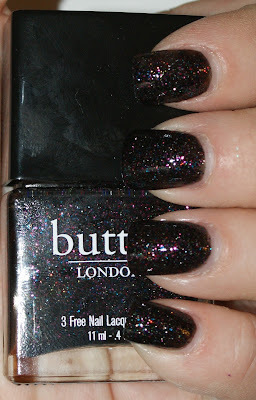 The Black Knight is the first Butter LONDON I have ever owned and rest assured, it won't be my last. Though it is on the pricier side at $14, I have to say that it is of very high quality and DPB, Toulene and formaldehyde (3) free. Ah I so need this polish in my life. It is so gorgeous!